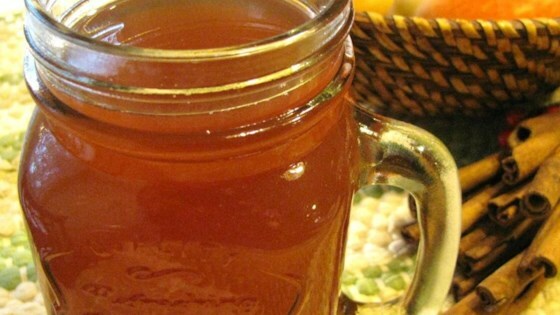 "A 'spiked' version of the traditional hot cider - great for fall or holiday gatherings. This can be made in large quantities and kept warm in an electric coffee server." Pour water into a large saucepan and bring to a boil. Remove from heat and toss in the orange spice tea bags. Cover and let steep 5 minutes. Remove tea bags and stir in sugar, apple cider, rum, and 2 of the cinnamon sticks. Heat just to steaming -- do not boil. Ladle hot cider into 6 mugs and drop 1/2 teaspoon butter into each. Garnish with a cinnamon "swizzle" stick. This is the best cider I've ever had. I made it for a party and it was a big hit, everyone loved it. This was so wonderful! All of my friends loved it and wanted the recipe! Took it to a cold parade and it certainly kept us warm! I will use this year after year - it's the best! YUM! I used a crock pot to keep this warm outside at a pumpkin carving party.